The senator said he does not want the knockout dealt by Juan Manuel Marquez to occur to him again. “I know he is going to counter me but we’re ready for that. What happened in the Juan Manuel Marquez fight will not happen again. It was a mistake and I learned that mistake. We’ve worked on that in this training camp. I am prepared for Broner’s style," Pacquiao said. The eight-division world champion explained he has no ill feelings towards Broner in order to score a knockout. “I don’t need to dislike my opponent to want a knockout. I’m just doing my job in the ring. If the knockout comes, it comes. We’re hoping to have that opportunity Saturday. I have to pressure him to make him open up. Wherever he goes, I’ll be there." He said he fought outside the United States because they want to see him fight there. "I fought in other countries because they wanted to see me there. Now I'm back to the United States," Pacquiao said with a wide grin. "America is my second home. My second daughter, Queen Elizabeth, was born here in the United States." Pacquiao is very happy returning back to fight in Las Vegas particularly MGM Grand Arena. "Being back here at MGM Grand makes me so happy. It's an honor to be in this position. I remember my first fight here in the U.S. was at MGM Grand. I will never forget that moment, and now I get to come back here and do it again." "I feel so blessed and happy because of the excitement around this fight," he said. "It's come from the fans here in the U.S. and media all over the world. I want to go out there and make all the people happy." 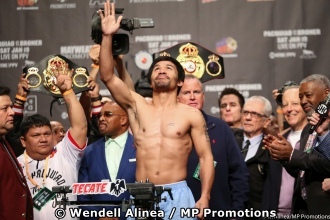 Pacquiao reiterated that the knockout in his last fight against Lucas Matthysse felt good like the younger days against Ricky Hatton, Miguel Cotto and other foes whom he stopped. "That fight was a big challenge for me to recover from the fight against Jeff Horn. People said that my career was done. But I never got discouraged, I just worked hard and made the knockout against Lucas Matthysse happen." Pacquiao added that when he lost to Jeff Horn in Australia many supporters and critics asked for his retirement from the sport he loved most. "People writing me off after the Jeff Horn fight was good for me. I'm not mad at anyone who thought that. It just became a challenge and a test to me of whether or not I could still show my best." Broner's behavior was the exact opposite of Pacquiao's. He explained that this fight is one of his biggest especially against a legend. "I'm not in awe of any fighter, especially Manny Pacquiao. I hope he's in awe of me," Broner said. "I'm a one-of-a-kind fighter, too. I've made history in this sport. I just have to go out and win this fight, then everything is going to start going my way. Saturday night, I will be victorious. This is a defining moment in my career, and it's going to be one of the biggest nights of my life." Broner said Pacquiao hasn't fought him so he is not worried about what he says about him right now. "He's going to have a different outlook after he fights me Saturday night. I'm going to turn Las Vegas into a big block party after I win on Saturday night. It's going to change my career. Mann." Pacquiao has done a lot for the sport. I'm going to beat him up and have a drink with him afterward." Pacquiao is not the only professional boxer turned public servant in the boxing world. Three-time world champion Alexis Arguello, after he retired from boxing, became mayor of Managua, Nicaragua's capital, in November 2008. But just seven months after he assumed power, he was found dead in his residence due to several gun shot wounds.